The 2011 FDA Food Safety Modernization Act aims to reduce the significant public health burden resulting from foodborne disease and as a result food manufacturers can expect ever-increasing scrutiny of their safety systems in years to come. Fast, efficient and reliable food testing methods will become even more important in this environment. CEM Corporation has been at the forefront of food testing methodology for more than 30 years. With the introduction of the revolutionary new iWave contactless temperature control system in the MARS 6 microwave digestion system we are able to provide food scientists the ability to finely control the digestion process without the need for temperature probes. In our study four different types of wet/pureed baby food were simultaneously prepared on the MARS 6 with iWave temperature control for elemental analysis. In order to provide a more representative sample with a lower acid concentration we utilized a 5 g sample and less than 5 mL of acid. Foodborne disease represents a significant, costly and largely preventable public health burden. According to the Centers for Disease Control and Prevention, 1 in 6 Americans get sick from food each year, with 128,000 hospitalizations and 3,000 deaths. For the food industry, the costs of recalls, lost sales and legal fees run into billions of dollars. In a move to reduce the occurrence and impact of foodborne disease, the FDA has recently introduced the FDA Food Safety Modernization Act. The Act raises requirements for effective prevention and monitoring and gives the agency greater enforcement powers. The need for effective and reliable food testing is thus only going to increase. Manufacturers of infant and baby food face perhaps even greater scrutiny than other niches, given the potential risks to growth and development in this population. 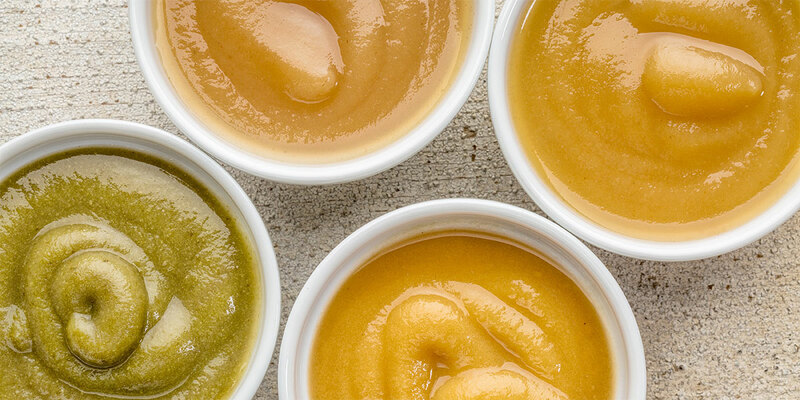 The level of concern and media coverage that followed research showing high levels of heavy metals in some baby foods is testament to the need for vigilance and the best possible testing regimes. This application note describes acid digestion of baby food samples using batch processing on a MARS 6. We attempted to use larger sample sizes than a typical digest as well as minimize the acid concentration. All samples were run in a single batch in order to maximize efficiency. The use of the iWave contactless insitu temperature measurement system provided the accurate temperature control of every vessel making this possible. The MARS 6 microwave digestion system with iWave temperature control was used to digest the samples. The MARS 6 provides batch acid digestion for up to 40 samples in a single run, allowing rapid processing of large numbers of samples. The MARSXpress 55 mL PFA reaction vessel was used, but other MARS 6 vessel types (MARSXpress 75 mL, MARSXpress Plus or EasyPrep Plus) could equally be used under the same conditions. An Agilent 700 Series ICP-OES was used to analyze the samples. All Samples were diluted to a final volume of 50 mL prior to analysis. Four types of Baby food samples were weighed into a 55 mL PFA MARSXpress liner and acid was added. One mL of a 100 ppm spike that included Pb, As, Cd, Fe, Se was added to each sample. Samples were run in duplicate. The vessels were capped and then inserted in 40 position turntable and placed in the MARS 6 for digestion. The One Touch Food method was used. The One Touch technology automatically counts the number of vessels and recognizes the vessel type. It then chooses the optimized conditions for the acid digestion. The total time including cool down was approximately 45 minutes. The throughput of the system is such that over 100 samples can be processed in a single day. As illustrated in Figure 2 the system automatically adjusts the power to compensate for the mixed samples, so that by the end of the ramp time all samples are digesting similarly. 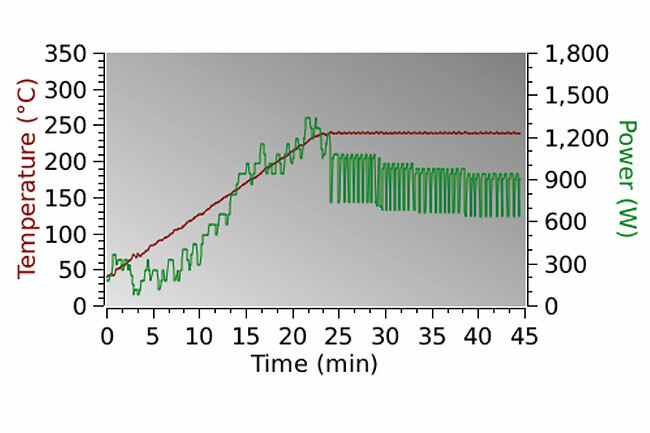 All samples were clear and colorless upon dilution as seen in Figure 1.
iWave technology provides precise control of the temperature of all samples during the digestion process. The results shown in Figure 3 are an average of the duplicate run which were spiked with 1 mL of the 100 ppm solution of Pb, As, Cd, Fe, Se. This provides an actual value of 2 ppm per element based on the 50 mL dilution. Results are good for each element including As and Se which of course are volatile elements.